This publication is copyright Democratic Dialogue 1995 and is included on this site by permission of the publisher. You may not edit, adapt, or redistribute changed versions of this for other than your personal use without the express written permission of the publisher, Democratic Dialogue. Redistribution for commercial purposes is not permitted. This is the second report from Democratic Dialogue, a new think tank based in Belfast. Democratic Dialogue gratefully acknowledges the generous support of its funders, including the Joseph Rowntree Charitable Trust and the Joseph Rowntree Reform Trust. It also acknowledges the generosity of the authors of this report, who write in a personal capacity. Their views do not necessarily reflect those of other contributors, or the management committee of DD. Further copies are available from the address on the inside front cover, price £7.50 (£10 institutions, £4.50 unwaged) plus postage and packing. DD aims to publish six reports per year. Readers may wish to return the enclosed subscription slip, to avail of reduced-rate payment for all reports, free copies of DD's newsletter and notification of all DD events. Our next report will begin the exploration of a theme at the heart of DD's concerns-Reconstituting Politics. This is the first report from Democratic Dialogue on a substantive theme, following the report of our launch conference in June, which determined DD's agenda over the coming months. 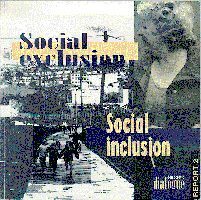 The rationale for focusing initially on 'social exclusion' was twofold. Firstly, there is widespread recognition that, whatever progress may or may not be made towards a political settlement in Northern Ireland, there must be tangible changes in people's lives, particularly for those living in areas which have been the seat of military conflict, if those who have suffered most are to feel hope for the future. Otherwise, they may feel scepticism at best, and cynicism at worst, as to the long-term impact of the paramilitary ceasefires. It is far more evident that business has benefited from the new context - particularly tourism - than that disadvantaged areas have experienced any real improvement. Secondly, the theme of social exclusion has been rendered topical by the 300 million ecu European Union 'peace package' for Northern Ireland and the border counties, in which it figures prominently. This report, however, does not focus on the EU special assistance, which, after all, is a one-off windfall which pales in comparison with the Westminster subvention to the region: it represents some £250 million sterling, over three years, as against annual British government expenditure, net of revenue, in Northern Ireland of £3-4 billion. This report seeks to take a longer and wider view. What is crucial, if Northern Ireland is ever to become a society 'at ease with itself' - in whatever constitutional context - is that the issue of social exclusion itself moves in from the margins of policy to the heart of government and becomes a long-term policy priority. The overview which begins this report, from Hilary Silver, an international expert on social exclusion, indicates why. In a uniquely well informed survey of the international scene, Ms Silver focuses on the core and arguably the most intractable issue - long-term unemployment. She shows that there are a raft of policies which can ameliorate the problem, but none is a panacea and none is without limitations and weaknesses. The implication is that a concerted, sustained strategic approach is essential to meet the scale of the challenge. Northern Ireland's political lexicon seems to expand much faster than meanings are pinned down, and Avila Kilmurray explains why social exclusion is not just a posh way of saying poverty. Ms Kilmurray explores the diversity of experience of social exclusion in Northern Ireland - including how communities can be the authors of exclusion as well as its victims. This diversity is important for policy-makers to recognise, if they are to develop sufficiently nuanced and sensitive responses. Patrick McGregor and Patricia McKee underpin this qualitative presentation of social exclusion in the region with a statistical analysis of income inequality, how wide it is, how much it has widened over time, and how it compares with the situation in Britain. Pauline Conroy meanwhile compares experiences north and south of the border, both in terms of substantive policy programmes and the processes of addressing social exclusion. Turning to what can be done at the regional level, Paul Gorecki and Cormack Keating argue for the piloting of a reform of social security in Northern Ireland, with a view to tackling social exclusion. Frank Gaffikin and Michael Morrissey look at the other side of the fiscal equation - whether taxes can be tweaked in a redistributive direction. And Maura Sheehan and Mike Tomlinson argue that to assuage long-term unemployment 'supply-side' measures will not be enough: demand for jobs will have to be increased. Social inclusion is about more than welfare and work, however, and the next two contributors look at how doors can be opened for the socially excluded in health and education. Tony Gallagher mounts a robust criticism of the maintenance of selection at age 11 and calls for a reversal of spending priorities. And Paula Kilbane highlights the minuscule budget for health promotion, while stressing also the importance of developing partnerships with disadvantaged communities. Processes are indeed as important as outcomes in addressing social exclusion, and the following three contributors explore how the socially excluded can acquire an effective voice. Richard Jay demonstrates that this raises very real dilemmas - including for those who seek to represent the socially excluded. Amidst increasing concern about the growing dominance of quangos in the governance of Northern Ireland, Anne Marie Gray and Deirdre Heenan look at the exclusive character-notably in gender terms - of quango membership. And Quintin Oliver suggests that the practices and the ethos of the voluntary sector may help flesh out ideas of partnership and offer a vision of a society in which everyone can feel a stakeholder. Finally, Paul Teague - who has played an invaluable role in organising this project-and myself set out some strategic conclusions, drawing together the strands of the report. We suggest how social exclusion can become a long-term policy priority in Northern Ireland and where the resources can be found. But we also emphasise that for so long as the region lacks a politics of common understanding, the battle against social exclusion will never effectively be won.